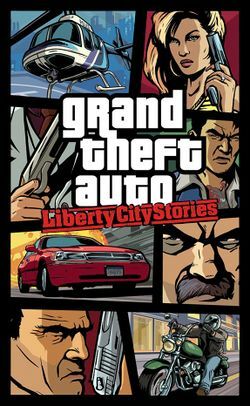 Grand Theft Auto: Liberty City Stories is the first game in the Grand Theft Auto series released for the PlayStation Portable on October 25th, 2005 in North America, and on November 4th in Europe. The PlayStation 2 version was released on June 6th, 2006 in North America, and on June 22nd in Europe. Set in Liberty City in 1998, it is a prequel to the events of Grand Theft Auto III. There are a million stories in Liberty City. This one changes everything. Once a trusted wise guy in the Leone Family, Toni Cipriani was forced into hiding after killing a made man. Now he's back and it's time for things to be put right. The streets of Liberty City are in turmoil; Warring mafiosi vie for control as the town begins to self-destruct under waves of political corruption, organized crime, drug trafficking and union strikes. No one can be trusted as Toni tries to clean up the mess of the city's chaotic underworld. Deranged hit men, morally depraved tycoons, cynical politicians and his own mother stand in his way as Toni tries to bring the city under Leone control. This page was last modified on 20 April 2012, at 19:41.